Crime in the Orre region has been rising, and now a new threat has emerged: Shadow Pokémon. These Pokémon have had their hearts closed and will not hesitate to attack their trainers. A defector from a gang of Pokémon thieves and a girl who can see the dark auras of Shadow Pokémon set out to snag them all and open their hearts. Wander around the towns of the Orre region with your partners Espeon and Umbreon. Battle Pokémon Trainers to earn experience. 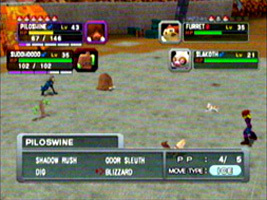 When you encounter a Shadow Pokémon, use the Snag Ball Machine to capture them, then train them in battle to heal them. When they are ready, take them to the Celebi Shrine to open their hearts and relearn all of their standard attacks.